The Cotswold Hunt, Aylton Manor. A 3C sab met up with our freinds from Cirencester Illegal Hunt Watch to spend a very wet day watching this hunt try to flee from us all day. We arrived to find multiple hunts represented including the Heythrop, the Berkeley, some North Cots, some Croome and other ner do wells. Massive meet but they soon moved off east (being on the Heythrop border to the west) and towards the A436 moving fast when it was apparent that we were around and on towards Salperton. They drew a rough patch there an a hare ran to safety but no fox found, hounds did find a used vomit bowl,bedpan and urinal but not much else!. YUCK! They then ran to Gazeley Wood, and on through to Hawling Lodge, fast north to Hollow Grove and Hawling Grove….then fast south back to Hawling Lodge ad a brief scuttle around Nettleton Hill wood and then fast north again to Guiting wood. We were going dizzy by this stage and then they were back in Hawling keeping on the move to avoid us rather than actually hunt. They were sabbed by the weather as wind and heavy rain had probably made a) any sane fox to be well sheltered and not likely to want to budge and b) if they had the scent would have been blown to eternity as well as washed away. This week’s been nicely eventful so far. With the likelihood of David Redvers and the Ledbury hunt ccepting our challenge looking pretty low, Three Counties Wildlife Crime Watch took on the job of getting our fox body from February 19th to a vet for post-mortem as they and the police (and, of course, us) would like to confirm the cause of death. Cheers for that! Then on Thursday two of us headed out to Cornwall as one of the local hunts up here, the Heythrop Hunt (recently caught trying to dig-out by the Hunt Monitors) was having a joint meet with the Cury. The Heythrop hounds would be hunted by the Heythrop huntsman Charlie Frampton and it was an event too good to miss out on! We rocked up near the meet, dropping small teams of sabs off on foot in strategic places in view of the covert the hunt were drawing. It seemed to take a few minutes for support to realise who we were and run to let hunt staff know. Hounds were speaking as they had picked up on a scent and whipper-in and support were holding-up on the other side of the covert (who suddenly looked very worried as a team of sabs turned up). We believe they had scared the fox back in, but very soon after good ol’ Charlie was gathering the hounds and moving them on, leaving that fox alone. Since the Heythrop were convicted of illegal hunting a few years back, they have been a little wary of cameras! Good move on his part in that fox was left alone and therefore no evidence of illegal hunting was obtained. Bad move in that he proceeded to draw blank in almost every other covert he drew throughout the day – shame about having to leave that first one alone, hey Charlie? We can’t say for sure that there were no kills – we did lose the hunt for about 30 minutes at one point and terrierman Gary Morgan was out and about, so nothing is certain, but when we were near no sabbing was actually needed after that first draw, other than putting Charlie on edge with our mere presence, cameras in hand. We had some odd comments from landowners who kept us entertained with their views on being hairy-nippled lesbians (it’s most fun being one on a Sunday of all days apparently…) but that’s about as exciting as the conversation seemed to get with the support. It was great to meet new people and old friends alike and see an effective use of numbers and communication between foot sab teams and vehicles. Many thanks to Kernow Hunt Saboteurs for hosting us all at the hunt and to Somerset Anti Blood Sports, Dorset Hunt Sabs, Devon Hunt Sabs and the sab who came down from Swindon Hunt Saboteurs for being a good laugh, putting us up / putting up with us and all working well together. Thanks guys! Yesterday saw a 3C sab meeting up with Cirencester Illegal Hunt Watch to visit the Cotswold Hunt – watch this space as the report will be going up separately soon. So this end-of-season lark isn’t feeling very end-of-seasony as even though our regular packs have now packed up (the South Here being the latest this season and who finished on Saturday) we’ve teamed up with good friends and allies Cirencester Illegal Hunt Watch again and visited the Beaufort Hunt on Saturday (whilst other 3C sabs met up with the fantastic North Shrops Sabs for the South). Then we were back out with CIHW yesterday to keep an eye on the VWH who usually finish in early April. Busy busy. We’re also now looking for more information from any locals regarding their last meet of the season last Wednesday as it has been reported that they killed 2 deer and lost control of much of the pack of hounds for quite some time. Additionally, it seems David Redvers and the Ledbury will not take up the challenge regarding the fox body (if it was shot, our friend will pay £1000 to the Air Ambulance, if killed by dogs, they pay it). So watch this space as the video and PM results will be up soon. We delayed putting up a report from Saturday due to sharing the news from South Coast Hunt Sabs and the League Against Cruel Sports. We hope all sabs and monitors concerned in all of those incidents are recovering now and know we’re here for support if needed. As for us, we split once more to cover different hunts and some of our sabs headed to the Ross Harriers along with North Shropshire sabs, being joined by Bristol Hunt Saboteurs and South Wales Hunt Saboteurs. We managed to physically stop the pack on a couple of occasions with sabs jumping into fields and rating them and a North Shrops sab did some excellent sabbing despite being our driver. Unfortunately at one point during the afternoon, hounds picked up and went into full cry after a hare in a field. She was spotted only a couple of metres in front of the lead hound and the huntsman arrived quickly, hunting them on. It lasted only a few seconds before hounds stopped speaking, so we believe that she was killed by the hounds. Very little is usually left of hares when killed by a pack of hounds, unlike with fox kills when you can normally find some evidence. We certainly made their day more difficult though and did stop the pack or hold them up on various occasions. The Harriers are finishing the season early this year, so that’ll be more lives left in peace for a short time. The last meet of the 2015 – 2016 season for the Ledbury Hunt. They met at the Elms School, Colwall. As some of you may remember, The Elms include the criminal offence of fox-hunting as part of their physical education curriculum. Sure enough, many children were in attendance as the pack hunted through British Camp down to Castlemorton Common where the children were taught how to ride at and assault sabs on land managed by the Malvern Hills Conservators who allow blatant illegal hunting on the public land they are entrusted with. Newborn lambs fled both hounds and the multitude of children on ponies. Despite this sabs from 3C and North Shropshire intervened on a number of occasions to slow the pack down from hunting foxes. One pack finished for the season, a few more to go. A brief foray with the Ross Harriers today saw them hunting a hare from Llangarron. As hares circle it was a matter of waiting for her to come around and getting between her and the lead hound. 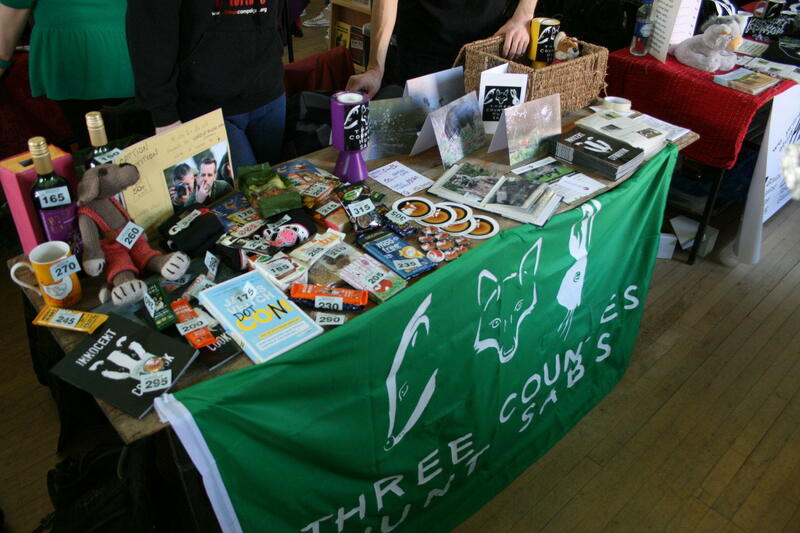 With the Evesham Vegan Fair going ahead today, we split the group into 3 in order to man a stall at the fair as well as go to the Ross Harriers and North Cotswold hunts. The Harriers had their ever-dwindling presence with just the 4 hunt staff, a (very small) handful of supporters and they packed up soon after 3pm. The day wasn’t without event though (please support South Wales Hunt Saboteurs in getting a new window…) and the presence of ex-Harriers terrierman James Smith was noted along with his bestie Luke who was nice having an outing in the countryside for the day. Meanwhile, at the North Cotswold, we found that we were to be stalked all day by 3 young ladies who like our taste in wellies, share a different taste in music and apparently do requests for singing…* Having listened to Classic FM from their car radio at live-orchestra-from-the-front-row volume, we decided to lose them and head inland instead. All we will say for now is that towards the end of the day we witnessed 2 holloas as a fox broke from a wood and ran cross-country with hounds in cry in pursuit. We, too, broke cover at this point in order to gather footage and try to intercept and were quickly pursued ourselves by falconer Calvin Crossman and eagle (still with hood on, definitely not hunting, hounds in full cry and giving chase across fields and fields nearby…) and his mate on the quad who kept riding at sabs to get in our way. They backed down as it became clear that we wouldn’t and sped out of the area as we neared a blocked badger sett in the field. One sab carried on the chase whilst the other gathered evidence and unblocked the entrances. Throughout all this, over at the vegan fayre sabs were consuming huge amounts of cake, selling our new greetings cards (all made with recycled paper, eco-friendlier ink and posted carbon-neutral!) with photos taken by 3C sabs and promoting our ever-popular tombola and caption competition. Thanks to everyone who took part, donated or just came for a chat. Cheers also to Black Badger Printworks for the help with the stall, leaflets and banner! And to Word of Mouth cafe in Evesham who donated gift vouchers for vegan food / drink as a prize for the caption competition! Good luck to the injured pigeon who successfully and impressively evaded capture despite the shot-wounds in his wing. He showed he could fly out of danger and pigeons are hardy, so fingers crossed. While two sabs followed the huntsman and hounds, another sat in a hedge watching an artificial earth (see photos) waiting to see if the hunt used it. He had been there about four hours at which point he got restless and decided to go for a walk to check some setts. As he walked across the field with the artificial in it he spotted the nose of a sky blue Nissan Navara (Reg YY12 LDN) entering the field through a gap in the hedge. The vehicle stopped for a split second then began to reverse at a fair speed. A reasonable distance away from the sab, the unknown driver and passenger, terrierman Oscar Bates, got out, quickly picking up mud with their hands and splatting it over the vehicles number plates before masking up. The driver complained about having his photo taken and explained he was working on the crops for the farmer. Funny, because the field with the artificial in has no crop – and we’re not sure running away from random walkers and the identity paranoia is normal behavior from farm workers… Once the terriermen left, the sab walked back near the artificial and continued to wait. Shortly after, Forthampton gamekeepers Kevin Yapp and Chris Bowers and a mate came looking for the sab on their buggy, checking on their pheasant kit nearby. When the hunt came by later in the day, supporters showed fairly clear signs of wanting to use the artificial, moving hedge sab on, but another sab had entered the area and they were unable to do so. The artificial is very clean and well kept for something that shouldn’t have been used since 2004. Perhaps the hunt are carefully maintaining it for when hunting becomes legal again – fingers crossed, never. Film from Beaufort meet with Cirencester Illegal Hunt Watch back on 23rd January 2016. Hounds marked to ground. Digout averted and (although not film) excellent police response. This man was caught by Hunt Monitors yesterday morning blocking an active badger sett. The Heythrop Hunt (previously convicted of illegal hunting on evidence gathered by the monitors) met nearby just a few hours later. If you know this man or have any information, please contact Three Counties Wildlife Crime Watch, the police or the Independent Hunt Monitors. A video is in the hands of the police at the moment. The sett concerned is in the Cotswolds and could well be targeted if badger culling is rolled out to the North Cotswolds area or the remainder of Gloucestershire. Badger persecution goes on outside of the culling periods as it always has done, but it surely will affect badger populations and perturbation, so how can the government continue with their culls knowing this information? Please ‘like’, share and support the Hunt Monitors as they do some fantastic work.